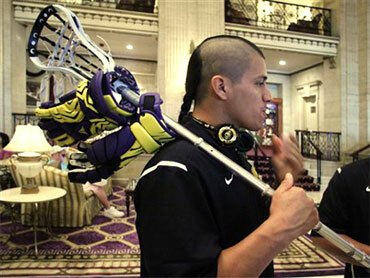 The British government is refusing to allow an American Indian lacrosse team to travel to England using passports issued by the Iroquois Confederacy. The decision Wednesday means the team will miss a world championship lacrosse competition in Manchester. A British Consulate spokeswoman says the team would be able to travel only with documents the United Kingdom considers valid. Tonya Gonnella Frichner, a member of the Onondaga Nation who works with the team, says it was told by British officials that members would have to use American or British passports in order to travel to Britain. The decision was announced hours after the U.S. cleared the team for travel on a one-time waiver at the behest of Secretary of State Hillary Rodham Clinton. The players regard U.S. government-issued documents as an attack on their identity. The British government said previously it wouldn't give the players visas if they could not guarantee they'd be allowed to go home. U.S. officials previously informed the team that new security rules for international travelers meant that their old passports - low-tech, partly handwritten documents issued by the Iroquois Confederacy of six Indian nations - wouldn't be honored. The Iroquois Confederacy oversees land that stretches from upstate New York into Ontario, Canada. The team needs to get on a Wednesday flight to make a Thursday evening game. Speaking to CBS News in London by phone from the team's hotel early Wednesday morning, the Iroquois Nationals executive director Percy Abrams said he believed they would make it to the lacrosse tournament. "The mood in the camp is very optimistic," he said. "The guys want to play. We feel we have done a lot of things, put our word out." The match, he said, was "the equivalent to the World Cup" of lacrosse and they would not give in to travel requirements from US authorities. He added, "The general consensus is that the Iroquois are the inventors of the game and it would be like having the Olympics in Greece and not having the Greeks there." On Tuesday, the 23 members of the New York-based squad arrived at a Delta terminal at Kennedy International Airport wearing team jackets and shirts. Their manager, Ansley Jemison, didn't expect to be allowed to board their flight to Amsterdam and wasn't surprised to be turned away at the check-in desk. But by showing up, the team avoided forfeiting its tickets. Airline officials said they would allow the squad to rebook its flight for Wednesday without penalty if it secured the proper documents, according to Jemison.